ScreenSteps Desktop 2.9 and Workgroup DocumentationScreenSteps Desktop & WorkgroupScreenSteps 2.9 TagsHow Do I Tag a Lesson? Tags can help you categorize lessons. 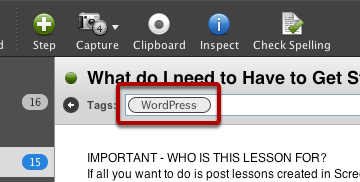 This lesson will show you the various ways you can add tags to a lesson. 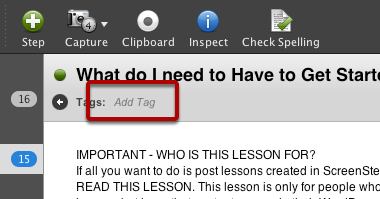 To add a tag to a lesson you are editing, load a lesson and select Add Tag. Type in the tag you want to add. You can separate tags with commas or by pressing tag. ScreenSteps will try to auto-complete the tag using tags you have already added to your library. This is what the tag will look like once it has been added. To add additional tags just click to the right of the last tag and start typing. Next: How Do I Tag Multiple Lessons Quickly (Using the Tag Palette)?